Helping your children prepare for their future is one of the most important things you can do for them—and yourself. And if, like most parents, you want that future to include higher education, it's never too early to start getting ready. By opening a 529 plan account, you've taken a significant step toward planning for your children's future. And the more you engage them in your planning, the more likely it is that they'll understand the importance of higher education—and setting financial goals. If you have school-age children, you can start talking to them about why education matters. Encourage your son or daughter to do well in school so he or she can pursue higher education someday. 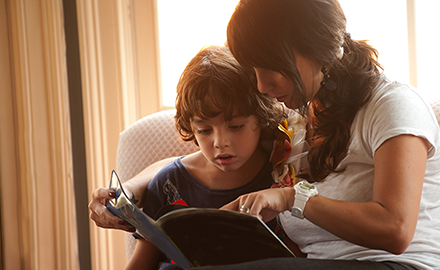 You can also spend time at home reading with your children and playing educational games. Once your children progress further along their academic journey, think about introducing them to the idea of preparing financially as well. Let them know that college costs a lot of money and that you've already started saving for it. You can help your children learn about saving by paying allowances and explaining that although some of the money is for spending, a portion of it should be put aside for the future. Consider taking your children to the bank to open savings accounts. Inject some fun into the learning process by introducing your children to online games that teach financial literacy. As your kids get older, talk with them about their interests and how those might lead to a college major and a career. Start when they're in middle school so they can choose the right courses in high school. And remember to keep building on your children's financial literacy. You could have them help prepare a family budget or show them how to balance a checkbook. To further enforce the idea of planning and saving in advance, urge your kids to put aside money for the big-ticket items they want—electronics, concert tickets, expensive outfits—rather than paying for them yourself. You may also want to talk about how loans work and what it means to carry debt. Explain to your children how saving for college now means they (and you) will owe less later. Once your kids are in high school, it's time to ramp up the college preparations. If they're offered, your children might want to take advanced placement courses or college-credit classes from an affiliated community college. Your children may also want to get part-time jobs so they can have some financial independence. Encourage them to open a checking account so that they can learn to manage their money. Talk honestly with your kids about what you'll be able to pay toward their higher-education expenses and what they'll need to cover themselves. One way to start this conversation might be to attend a financial aid presentation at their school. You could also work together to calculate your expected family contribution (EFC) with online calculators, such as the one offered by the College Board. Or, if one of your children is a high school senior, you can complete the Free Application for Federal Student Aid (FAFSA). You can also help your children research grants and scholarships that they might qualify for. Several online search engines, such as those offered by the College Board and Fastweb, can help. Starting early to help your children prepare for their future—both educationally and financially—can make a big difference to their success in college and beyond.